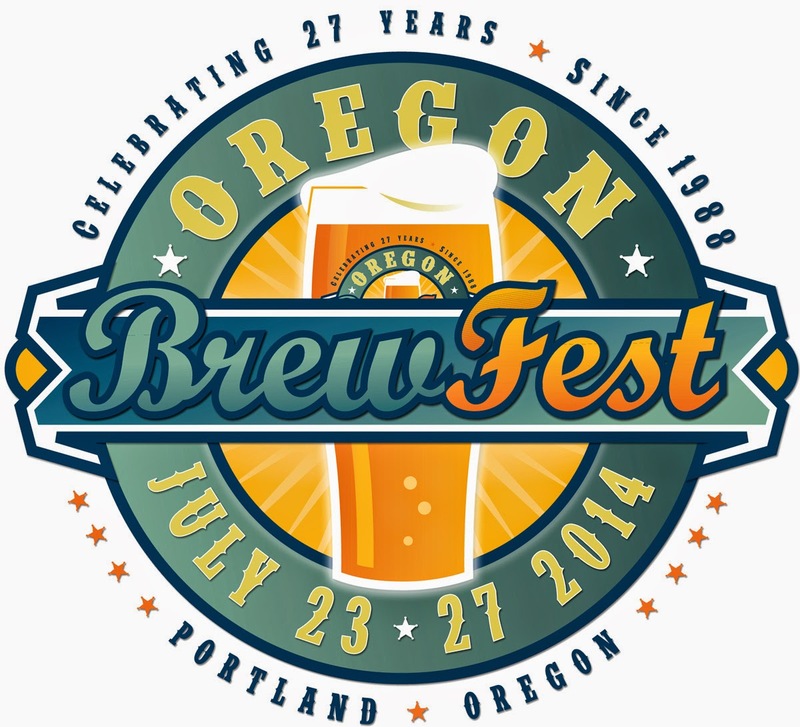 Next week's renewal of the Oregon Brewers Festival is arguably the highlight of beer year here. The beer scene has spawned a flood of smaller events through the year, but the OBF is the oldest and biggest. Most of those other events wouldn't even exist without the blueprint of the OBF. So I'm always somewhat amused when I hear some of my beer geek friends beating on the OBF. Gripes take many forms. Some don't like the crowds or the atmosphere. Others aren't impressed with the beer list. Still others think the event has become too commercialized. Look, I've been happy to complain about some of the shortcomings at the OBF. I wish they could do something about the lines. I questioned the move to a 3 oz taste last year. I frankly don't like the frat-like drinking atmosphere that descends Friday and Saturday night. I digress. As with any large event, you have to take the good with the bad. Things are always going to be crazy when you get a lot of people together. Add excessive beer drinking and you've got a recipe for potential chaos. But I've had far more good times than bad ones at the OBF over the years. 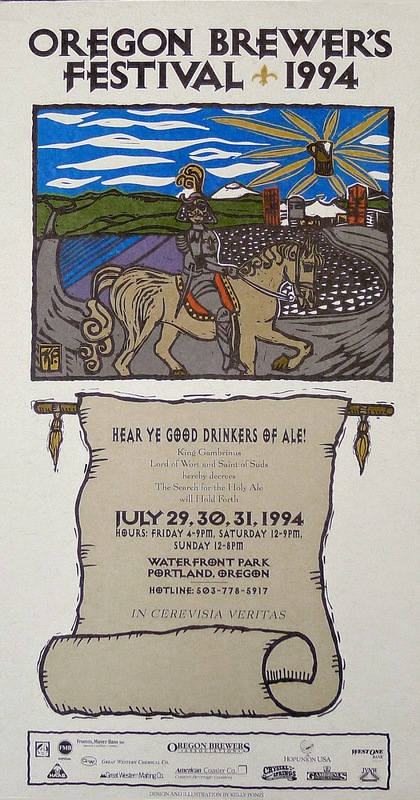 The first OBF was held 26 years ago this month, July 1988. That makes this year's event the 27th actual festival. We've come a long way in the intervening years. 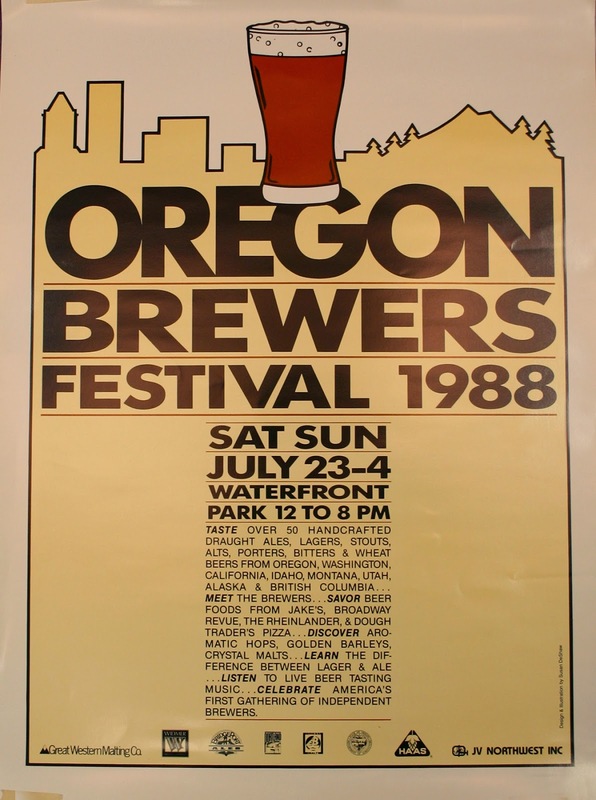 As the inaugural poster below shows, that first OBF was a two-day affair. Later, they added a third day, which prompted a lot of Friday afternoons off around town. Then they went to four days, prompting full days off. Last year they added Wednesday in an effort to spread the crowds out over more days. It isn't mentioned very often, but there has also been an evolutionary shift in what the OBF is all about. During the early years, it was mostly a chance for craft brewers to show off beers that differed from macro sludge. Today, the event is much more about beers that are unique or special even within craft beer. Many of the beers poured are brewed for the event. Want a great example? Last year, Heathen Brewing brewed Transgression IPA specifically for the OBF. This beer requires a special dry-hopping treatment. The effort paid off in a big way, as the beer was a huge hit and won the people's choice award. It also put Heathen, which operates out of a residential garage in Vancouver, on the map. That's the power of the OBF. There's also the economic impact. In the early years, the OBF was a far more modest affair than it is today. Announced attendance last year was 85,000. The financial benefit to the local economy is enormous, estimated at $31 million by a group that surveys attendees and analyzes the collected data. This is to say nothing of the countless spin-off festivals and events that boost Portland's bottom line. If you need one more indicator of how popular and mainstream the OBF has become, look no further than the annual Get My Perks promotion. The special offer went live the other morning and they sold the 300 available packages in less than 10 minutes. That's a package every two seconds. Ye gods! Organizers will pour 88 beers in 30 styles from the taps near the main tents. Don't get too caught up in the style guidelines. As in recent years, there are a lot of IPAs. But fruit beers have a solid presence and some of the IPAs actually double as fruit beers. There's something for everyone. You can review the beer list here and create your own pre-fest cheat sheet. It's worth mentioning that the Buzz Tent, which features rare and often barrel-aged beers, returns after taking last year off. They're now calling it the Specialty Tent. Expect to find some great, albeit costly beers in there. They plan to roll through more than 100 specialty beers during the course of the event. This is where you'll find the beer geek crowd. An added attraction will be some brewers visiting from Utrecht in the Netherlands, which has a Friendship City relationship with Portland. OBF co-founder Art Larrance traveled there last year and discovered a thriving craft beer scene that reminded him of the Northwest in the 1980s. He invited a group of brewers over and several Dutch beers will be poured in the Specialty Tent. There will also be daily meet the brewer sessions. It's all part of giving the OBF more of an international flavor. Last year's switch from the traditional plastic mug to a glass was well-received and continues. The glass is a far better tasting vessel and, coincidentally, helped obscure last year's other big change...the advent of the 3 oz pour. Three ounces in the old plastic mug would have raised some eyebrows. Three ounces in the bottom of a nicely tapered glass didn't cause much concern. Smart move. It's the same old story with tokens and glasses. The glass will set you back $7 and tokens are $1. There are a few places selling glasses and tokens in advance: Belmont Station, Cascade Barrel House, the Raccoon Lodge, Deschutes in the Pearl, the Green Dragon and Rogue Public House. You won't save any money, but you may save time in line at the festival. Even if some of my beer geek friends aren't especially keen on the OBF, I still think of it as the marquee craft beer event of the summer and year. There isn't a single event on the calendar that has close to the influence of the OBF. I look forward to it every year. If you're keeping track, I'll be attending Wednesday and will post findings and favorites on Thursday or Friday. See you under the tents.